LeRoy was born in Chicago, Illinois in 1958. He graduated from Sterling High School in 1976. He received his Bachelor's Degree in Law Enforcement Administration from Western Illinois University in 1980. 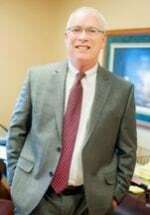 He graduated from Southern Illinois University of Law in 1983. He joined the firm in 1986, and has over 23 years of experience representing plaintiffs in personal injury claims. He concentrates his practice solely in plaintiff's personal injury claims, including automobile accidents, medical malpractice, wrongful death and premises liability claims.